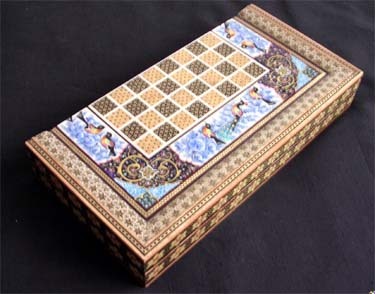 In Persian, the game of backgammon is known as takht-e-nard. Its exact origin is unclear, but it is thought to have first been played in Mesopotamia and Sumer about 5,000 years ago. The modern game seems to have developed directly from the Persians. According to H.G. Raverty, in an article entitled "The Invention of Chess and Backgammon": "Ard-Shir Babakan, son of Babak of the Sassanian dynasty of Iran-Zamin or the ancient Persian empire, invented it. The game was also sometimes called Nard-i-Shir after him." (Journal of the Asiatic Society of Bengal, ca. 1886). Click here for some additional information about the history of backgammon (in Persian). 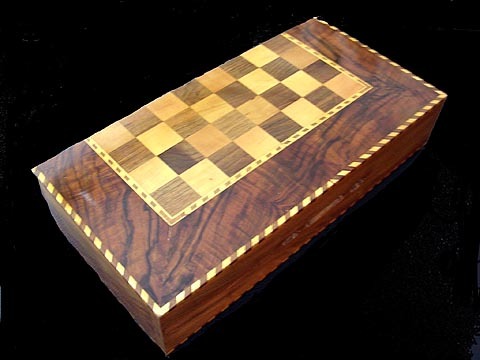 The game remains popular today, and backgammon sets are more than just playing boards: the fine craftsmanship that goes into their construction makes them as enjoyable to look at as they are to play on.